In the 4th century BCE, the ancient Greeks settled on Hvar at the head of a long inlet where the town of Stari Grad now stands. They called it Faros. It was a prime piece of real estate, not just for the protected harbour, but the adjoining land was the only flat fertile area in the Adriatic islands suitable for cultivation. They divvied it up, and gave each colonist a parcel. 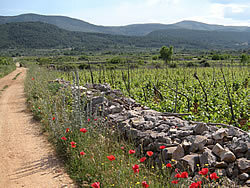 Fields were cleared of stone, which came in handy to construct dividing walls and pathways. Shelters were built, and irrigation systems installed. 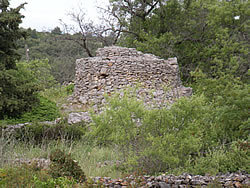 Watchtowers were constructed on the surrounding hills to keep marauders away. They grew grapes, olives and other crops for themselves and for export. The amazing thing about this process is that it’s pretty much all still there! 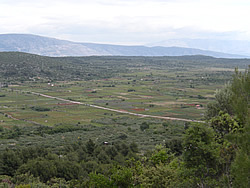 Continuously maintained down the years, the Stari Grad Plain is a living example of ancient Greek agriculture, complete with this year’s vines and olives. It’s still entirely recognizable 24 centuries later. The fields are laid out according to the original measurements by the Greek surveyers. Starting from the only pond, they divided the land into standard-sized rectangular parcels (chora) which they then bounded with dry stone walls. The system included a rainwater recovery system of gutters and storage cisterns, and small stone shelters, known locally as trims (pronounced treems). Walking along the ancient pathways, you can really get a sense for the continuity of a very successful system of agriculture, one that’s in harmony with the surrounding nature. The original Greek walls are very easy to spot for the sheer expertise of the work. They have the smoothest, most regular blocks, and the wall tapers elegantly towards the top. Later constructions use rougher stone, and some very recent ones use, gasp, mortar to hold them together. Wild flowers grow everywhere – come May there are splashes of red poppies, rock roses, honeysuckle, lots of herbs and many other Mediterranean natives. No pesticides here.